This beauty was built in1958, I was in Junior High and thought this was an unbelievably beautiful car. It features a Hilborn injected Dodge Hemi V-8. After years of being forgotten about and neglected it has been restored to as good as new condition by Roy Brizio Street Rods and is currently owned by John Mumford, Portola Valley, CA. 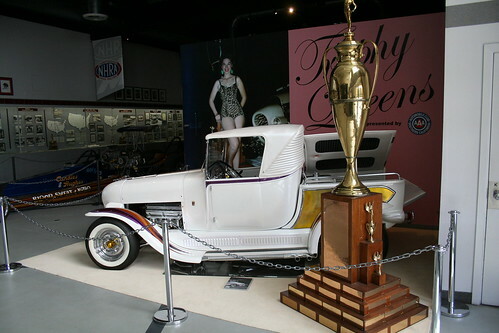 When these photos were taken (October 2008) the truck was on display at the NHRA Museum in Pomona, CA. I have a book, “How to Customize Cars and Rods” by George Barris and Wayne Thoms copyright dated October of 1963 (one month before President Kennedy was assassinated). In it there are pictures of the Ala Karte with text on how the car was built. My High School Study Hall time was often spent reading from this book rather than the conventional history books. Many years later, it was my great honor to meet George Barris and have him autograph this book. It remains one of my personal treasures. 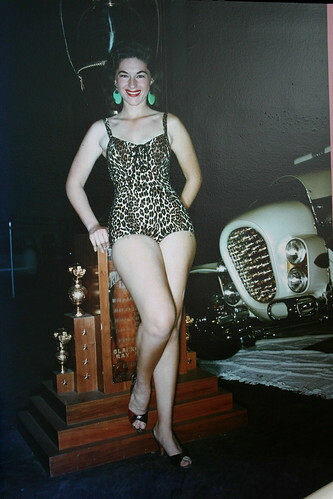 At the time the Ala Karte was the only undefeated champ to win the coveted Oakland auto show two years in a row-1958 and 1959. It was the first car to have a model kit fashioned after it. AMT not only brought out the plastic kit for the car they also purchased the car from the original owner Richard Peters of Fresno, CA. 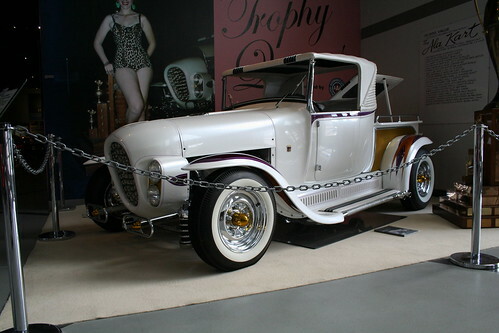 Ala Karte was built from a 1929 hot rod pickup. 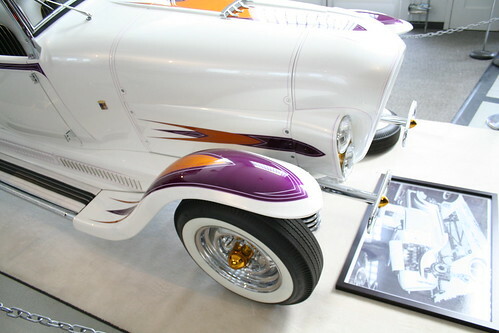 The Barris team added a 1927 T rear body section and extensively modified the truck bed. 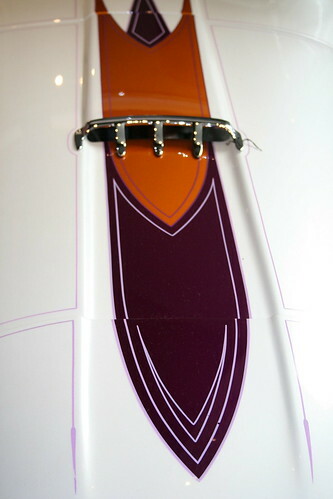 The fenders were reformed with peaks, and the running boards recessed for the dual exhausts on each side. 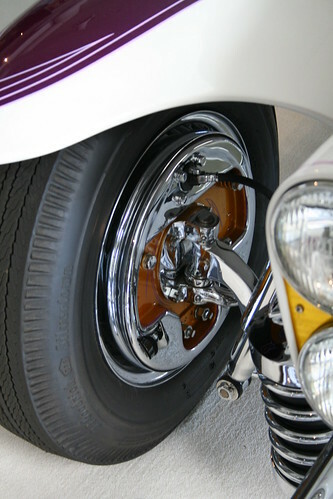 The entire front end was hand formed with tubing and aluminum into a tapered oval with quad headlights. Unusual for the time, was the suspension. It was coil springs with air bags at all four corners. 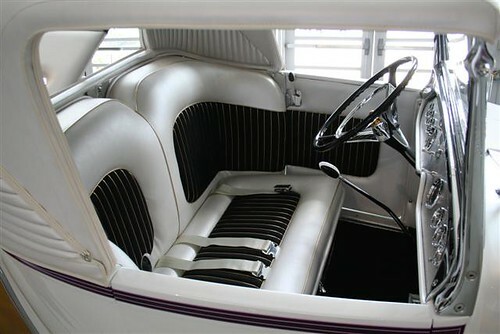 The interior seats are reminiscent of the rear Thunderbird seats that would not be produced until 1964-66. They look like a wraparound booth in a soda shop. 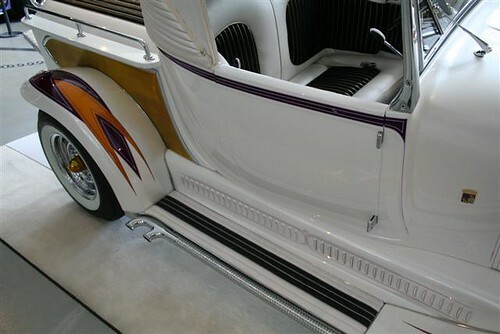 The seats are white Naugahyde with black velvet pleats that have chrome beading between each pleat. 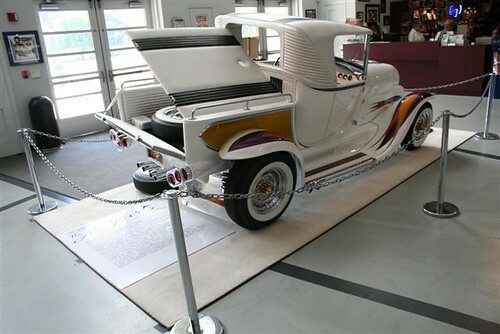 To quote the 1963 text: “The Ala Karte is valued at $15,000 although it is doubtful it could be duplicated for that price.” How far do you think $15,000 went towards restoring this ride? 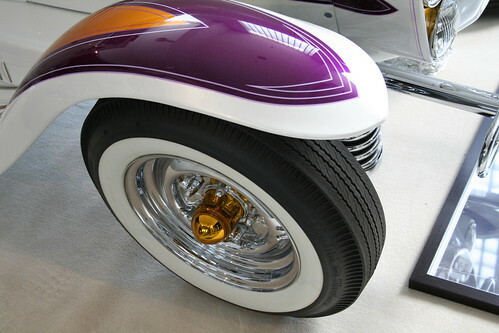 This custom car was way ahead of its times and stood out as one of the Premiere creations to be built during the early 1960’s. It still stands up and is a winner without all the techno bullcrap used today to build customs. This custom was all hand done the old school way. Barris left nothing over looked, and every piece and part of the Ala Kart is a delight to the eye. As unusual as the grille shroud was for the times… I understood it. It worked. It set Ala Kart apart from the crowd. 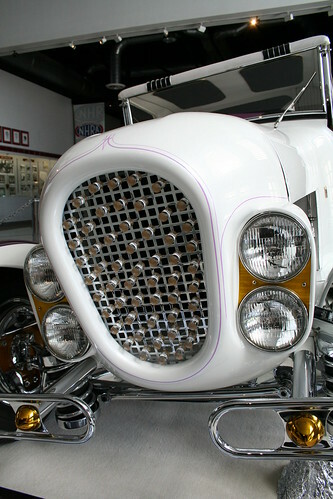 The Grille with the Plexiglas rods and golden accent was glorious. 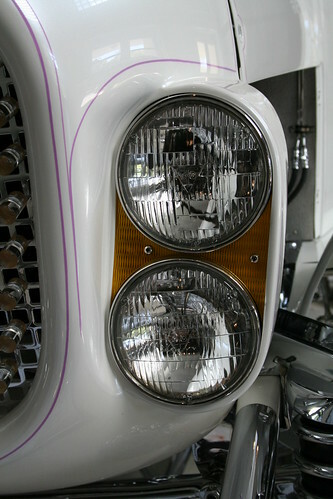 Same with the dual headlights with their golden trim setting. The White Diamond Pearl too was different, especially with the gold and purple scalloping and purple pin stripping. That was a master stroke of genius. The Chrysler Fire Power Hemi engine was an epic engine and was highly revered by custom builders. 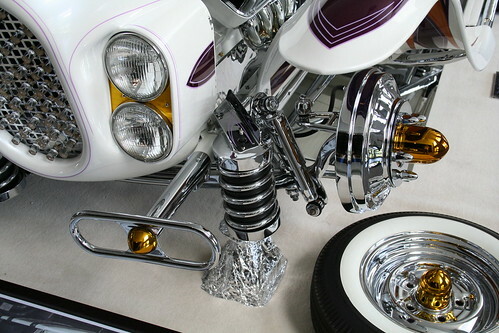 It is so clean in Pearl White and Chrome I think you eat from it. 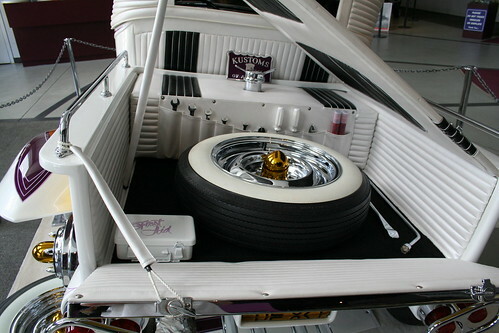 I love the interior theme throughout, and show chrome chassis is like fine jewelry paired with a Ermine Coat. 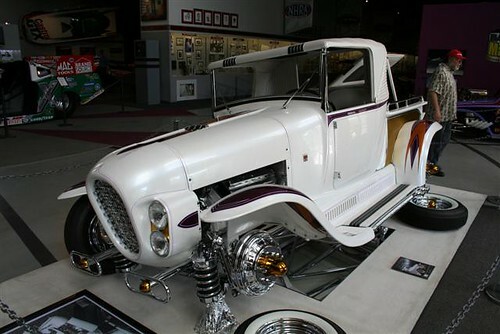 This particular custom car/truck should be in the Smithsonian as a national treasure, where it would stay in perpetuity for many generations to come and see it and marvel at a creation from an era long gone. Thank You for giving us the Ala Kart George Barris. RIP. 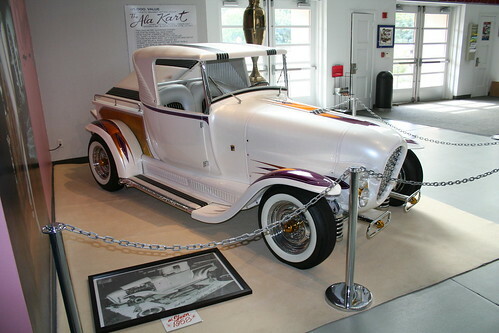 I agree, the Ala Kart is a classic in the same way the Coach Built cars of the 20s and 30s are. It is an important part of American automotive history and it does deserve a spot in the Smithsonian. 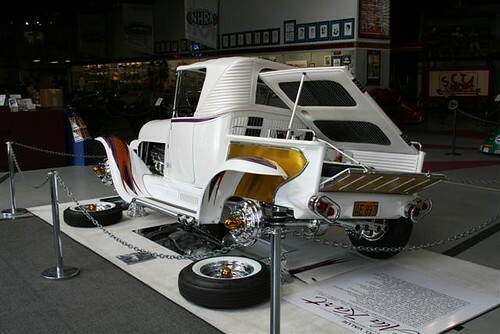 An amazing piece of automotive art.Not very often these days to see a hot rod customized like that.